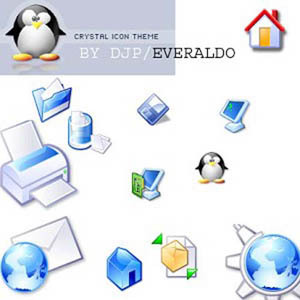 These are the ported classic crystal kde icons of Everaldo.com. I have permission to port them. recently opened documents icon is now shown in the startmenu. The networkicons and the help icon looked bad in small icon mode, that's fixed now. A quicktimeicon is added to the package. *remember, the icons look at their best on Windows XP! *please enable show icons in all possible colors in the settings of ikonpackager. OMGGG!!! ACK! AND MY TRIAL PERIOD FOR ICON PACKAGER EXPIRED!!! XD! ack! PLEASE PLEASE make this into an .ICL file.. or a set of just windows icons! PLEASE! Great set overall, but the small house is just the plain old house, not the cool blue one like the big house. It contains already an ICL file. Just rename crystal.ip to crystal.zip and there you'll find the ICL lib. cool icon set yo but can you get that penguin by it's self instead of it sitting on that thing? Yay. I love the KDE icons! Does anyone get the sick feeling inside that I do when I think about using Linux icons in Windows? I think it's a bastardization of part of what makes Linux unique / better than Windows. I mean, the Konqueror icon? Come on... that's going a bit far isn't it? The icon set IS beautiful, I like in on my LINUX installation.